Written by Mark Riley for the Atari 8-bit computers. Converted for the Commodore 64 by Al Rubin with additional graphics by Kelly Day. Converted for the Apple ][ by Larry Lewis. All three versions published in 1983 by Datasoft. Converted for the Commodore 16/Plus4 by Doug Turner for British Software, and published by Mastertronic in 1986 as "Prospector Pete". While trying to decide for something light and easy to start April with, my decision was set due to two things. First and foremost, the World of Spectrum forums are still offline, so I can't advertise anything Spectrum-oriented at the moment. Secondly, the letter 'O' looked a bit boring with only two games, one of which is officially useless. So, let's start this month with another Datasoft title, a company I haven't revisited since last September. 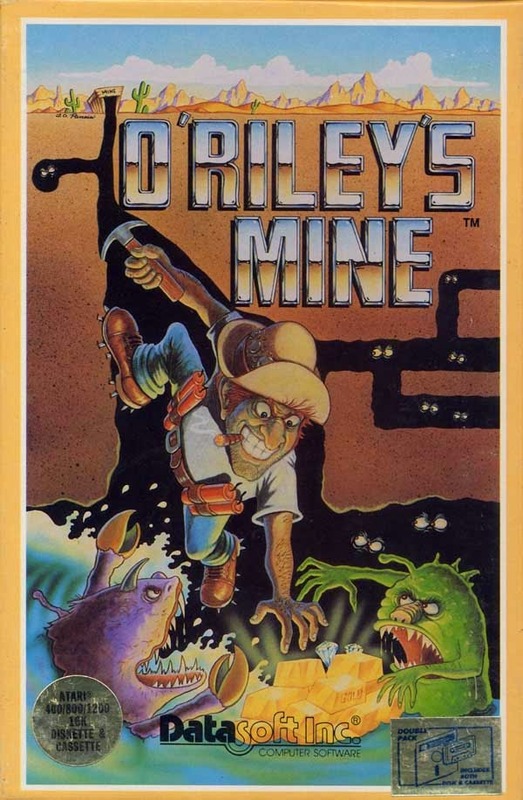 O'Riley's Mine is one of Datasoft's hidden treasures, mixing Mr. Do with Oils Well, or something like it, and doing it rather well even. In the end, it's not much more than a fun arcade game with a unique twist, which will begin to feel repetitive after a few rounds, but that's exactly the way many old games were. For some reason, though, this passed by many gamers back then, and it shows in the ratings on our favourite websites. At Atarimania, the game only has 19 votes, but the score is a rather acceptable 7.5 out of 10. Interestingly, at Lemon64, the game also has a score of 7.5, but the number of votes is currently at 49, as if to only confirm the game's worth to be what the Atari users have said, so I think we should just accept that this game is exactly that good. As for the Apple ][ version, you won't be surprised that I have yet again failed to find any ratings or reviews for it. In O'Riley's Mine, you take the role of an Irish miner by the name of Timothy O'Riley in a horizontally scrolling collect'em-up. Each level starts with you at ground level, where you have to make a quick decision as to where should you go to start digging, because straight at the bottom of the long narrow hole, a pile of dynamite is about to blow up, which will result in water flooding up the tunnels you are about to make. Your mission is to collect every bit of treasure scattered all over the limited area, but the constantly rising water acts as your timer, but it will only rise as far up as your tunnels allow it. So, in essence, it's a race against physics. To make things a bit trickier, the game will not allow you to mine more than one block's worth in any direction, but then again, you won't be able to get trapped under falling bits of ground. As an additional inconvenience, there are some roaming underground enemies trying to catch you, but being a seasoned prospector that you are, of course you have armed yourself with a few sticks of dynamite. The speed of monsters and water changes with the level of play, up to a point, so the game does offer a good deal of challenge. Like countless other arcade-style games of the time, O'Riley's Mine can be played by two players, but you will be taking turns, so the idea of fun there is shortlived. You also have the option to start the game from any of the first nine levels, so the more advanced players will not get bored as quickly. Still, it is an old-school arcade game at heart, so it does not have any long-term replay value to it, even with all the progressive difficult levels and two-player options and whatnot. It's just harmless bit of fun, with a couple of nice twists to it that make it stand out, and I can only recommend it as good way to waste your coffee break. Playing O'Riley's Mine is fairly straight-forward. You just take a joystick and start controlling. The fire button is used for dropping explosives, and the directions are used for controlling Timothy in the four main directions. And that is all there is to it, really, at least in terms of controls. Most of the gameplay elements I already mentioned in the above section... but let's repeat them just in case. You need to dig underground tunnels as quickly as possible to collect all the treasure items from each level, consisting of oil barrels, diamonds, even nuclear waste containers, before you can get back to the top and move on to the next level. Mind you, when the day turns into night, the nuclear waste containers turn lethal, so you need to be careful when planning your routes around the play area. To make your life more difficult, an underground explosion at the beginning of each level makes water flow and fill the tunnels at a steady pace - the further you get in the game, the faster it will become. Also, you need to look out for the underground monsters, which will come after you the second the water starts coming in. Well, now there's nothing to it but to start comparing the versions. The easiest difference to explain is the speed of the game. The ATARI version is the slowest of the lot at the beginning, and the APPLE version the quickest, but the APPLE version - at least the version I was able to find - has some severe scrolling problems. The screen will only move when you reach either end of the screen, and even then the screen will only move one character block's worth at a time, per half a second, making the simple job of scrolling the screen feel like a chore for the machine. Also, I keep coming across this strange problem with most APPLE games, that you can't push any key or joystick direction so that the said command would actually repeat on the machine without any pause in the command. This might be a problem with the emulator, which I'm very much hoping that it is, because then the owners of proper Apple ][ machines could enjoy their gaming sessions better than any emulator users are able to. Before I forget to mention it, since I'm still talking about the Apple version, there is a rather interesting difference in the tunneling method here: a single push ahead always makes enough of tunnel so that you can make an instant U-turn of sorts, effectively making it possible to make a "circle" within four blocks of movement space. This does help a bit, when you need to connect to an earlier bit of tunnel, which is in an awkward position to yours. But it's still not enough to make it more enjoyable. The C64 version is closer to the APPLE version in speed, but lacks any problems that the APPLE version exhibits. In the C16 version, the game speed is very close to the ATARI version, but the scrolling is a bit strange. Although it's definitely much better than on the APPLE, it tends to go on for a bit on its own accord before stopping, as if belatedly noticing that I stopped moving in that direction. The scrolling is fantastic on both ATARI and C64, and there are no complications regarding the simple controls. There is so little to compare about the game, really, that all I have left is to describe how your enemies actions differ for each version. From what I could tell, each version takes the difficulty level further on their own pace, and the little nasties' number and movement are affected by it. The C64 version seemed to have the quickest-developing enemy AI, but all the versions seemed to have the enemy AI in balance with their game speeds. The C16 version exhibits a clearly different behaviour in this regard, as the enemies all move in a rather leisurely manner for at least the first four-five levels. Frankly, it made the C16 version a bit boring. I might as well end this section in a rather backwards way, with the start menu. All the versions start off with a title screen of sorts. On the ATARI and C16, the title screen includes the options, while the C64 and APPLE versions display the title screen separately from the main menu. The main menu features options for starting level and the number of players in all three official versions, while Prospector Pete has no two-player option, but choice for joystick and keyboard controls instead, as well as the obligatory level selection. In the APPLE version, you can't see the options clearly written on the screen as in all the other versions, but instead the player and level numbers will flash at the beginning of the game, indicating your ability to make your selections then. All in all, the APPLE version is just not very comfortable, although it does offer one interesting difference to all the other versions. Even the C16 version is overall much better, although it offers a more certain way to boredom. Depending on your reacting skills, you might enjoy either the ATARI version or the C64 version better, but I'd say they're pretty much equal. 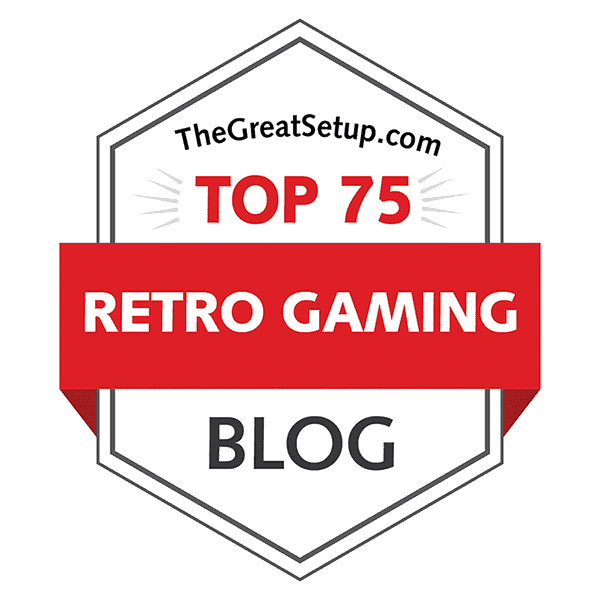 The only thing that gives the ATARI version any upper hand over the C64 version is that it has a proper high score list, while the C64 version only has just the one high score. At first look, you might say that here we have a game that is graphically only slightly more interesting than Pac-Man. The whole game is played within a single area, where the only variables are the time of day, the amount and placing of collectables, and the number of monsters. Happily, though, there are some differences between the versions to warrant some closer inspection, starting with the title screens and menus. Title screens and menus. Left end: Atari 8-bit. Middle: Commodore 64. Top right: Apple ][. Bottom right: Commodore 16. I included the ATARI disk loader in there, just to fill up the spot nicely, since none of the other versions have any sort of actual loading screens. The C64 version has a nice separate title screen by Kelly Day instead, which could have well been just a loading screen, but this is fine, too. The APPLE version starts up with a slow animation of the title getting revealed onto the center of the play area, after which is gets half-filled with water, and the moon passes by while at it. Nice, but the ATARI version doesn't really mess around with useless intro bits because it doesn't need to. All the cool stuff comes with its use of colour in the text bits under the title logo, although you can't really see it here, since the picture is not animated. The C64 title menu is a bit basic, but it works in its own way, since it gives more importance to the in-game graphics that way. And then of course, Prospector Pete has a very own style, completely different from the rest of O'Riley's Mine's versions. The blue background scrolls up, while the lower window with the high score list and options features a text scroller, which naturally goes to the left. To be honest, I was a bit disappointed in the graphics here. Sure, you get the obligatory signature Atari colour-mad things in the game, this time them being the enemy sprites, and then the explosives make the screen jerk up and down a couple of times, but that's pretty much it. The sky looks nice enough with its shading, but it doesn't change colour, so apart from the moon occasionally showing up, you can't really tell what time of day it is. Not that it matters all that much, but since you get a moon to show you the time passing, it would be nice to get everything else to go with it. There is also something a bit wrong with the choices of colour, because at the bottom of the screen, you get a very dark red colour for the dirt, and often there are very dark purple treasures on that level, which can be very hard to see. Rather irritating, if you ask me. The C64 version isn't much better in terms of artistic value or quality, but at least now you can see the day turn into night, and vice versa. All the enemies are of their very own colour instead of just going through the entire palette as they go, which is actually nicer this way, because it looks like each of them has their own personality. Which they do. All the treasure items are easier to notice, because they're uglier and less colourful, but at least it works to their, and more particularly, your advantage. In case you were wondering about the explosives, they do cause some sort of an effect - a couple of white flashes in the tunnels, and an almost unnoticably quick sideways movement at the same time. Perhaps it's not as impressive as the Atari version, but overall, the C64 version's graphics are more functional, which in this particular game is more important. Besides, the exclusive title screen is pretty cool. You can't see the sky changing its colour in the APPLE version either, but then you probably didn't even expect it. What I do like about this version is the style of the ground layers, which is actually much more natural than in either of the previous versions. Also, the mountains look better, and all the treasure items have a more personal look to them, but that's as far as I can go with the positives. Your enemies are just rectangular things with no personality, although they have a different colour in the water than out of it. Oh well, too bad for the bad scrolling and the lack of anything actually impressive. Screenshots from the Commodore 16 version. The C16 version takes after its cousin, and gives you 7 colour variations in the sky, which is actually more than what you get on the C64. The top of the screen actually looks fantastic compared to any of the other versions, so I'm a bit impressed here, really. However, once you get below the surface, the graphics are entirely made of four colours: white, black, grey and brown. If it weren't for the top of the screen, this version would be dull indeed. There is no change in the colour of dirt according to the depth at all, all the treasures are either grey or white, you and your enemies are mostly grey, and even the water looks like milk. Only the info section at the bottom of the screen has another, completely unconnected colour in use, which adds a slight sense of balance in the mix. Although the Apple version looks more interesting initially, the C16 happens to offer something more functional and even impressive. Game Over screens, left to right: Atari 8-bit, Commodore 64, Commodore 16, Apple ][. Of course, we must end this with a Game Over, because there's no other way in this game. Only the ATARI and C64 versions feature any proper sort of a Game Over message, while the APPLE version just ends the game and shows a "Press fire" text below your final score. The C16 version has a lengthy message to go with the bit where you enter your six chosen letters onto the high score list, which is the closest to an actual Game Over message you can expect from it. All things considered, the C64 graphics work just slightly better than the ATARI graphics, although both are very strong with their own specific things. I just happen to like functionality over useless effects, and if something extra has been given, it will be taken into account. The C16 conversion beats the APPLE version just slightly, which is a bit of a pity, because the Apple version does have some interesting graphics in it, but the bad scrolling and the lack of anything really impressive makes it the lesser choice. O'Riley's theme tune is a joyful oompah-style tune, very reminiscent of either old swing tunes or traditional country melodies, perhaps even circus/carnival music, but I can't really place it anywhere specifically. On the ATARI, the instrumentation is closer to all the early Nintendo tunes, with nothing particular in the beeps, but there's just three beep tones playing a rhythm track and the melody simultaneously. On the C64, the theme tune is a bit quicker and the instrumentation is more flavoured with filters, making it feel more like an amateur brass trio or something. The APPLE version of the theme tune is as fast as the C64 version, but is single-channeled, so it sounds like a bad DOS or Spectrum 48k rendition of the tune. Although the game looks like a relatively simple one, the C16's memory was apparently so full already, so Prospector Pete was left without a theme tune. Since it's been such an easy comparison to make otherwise, I'll be doing a bit more detailed comparison of the sound effects this time. The sound effects in the ATARI original feature a fairly loud walking "tap-tap" noise when you plough your way under the ground, a slightly muffled hissing of the dynamite's fuse when it has been set to detonate, a very effective (with a nice low end) sound of explosion whenever a dynamite goes off, the very quiet hissing sound of water flowing constantly in the background once the initial dynamite has blown up, an ascending bleepy pick-up sound effect for picking up items, a death sound effect which almost sounds like a mocking laughter often heard in cartoons, and the bonus counting blip sound for each unused dynamite after the level has been completed. Also, a very brief part from the end of the title theme song is played every time you complete a level. Compared to the ATARI version's sounds, the C64 sounds are more of a hit-and-miss deal. You get two different sounds for walking, one clean and loud one for the open bits and a slightly muffled one for ploughing new tunnels, which is a nice contrast. For picking up things, you get a more subtle sound effect, which is more like a tapped arpeggio than a sliding sound, and it's not as noisy as the effect on the ATARI. The explosions and the hissing noises sound a bit different on different SID chips, but considering the game was developed while the 8580 didn't exist yet, the 6581 chip is supposedly the way it should be heard. And on the 6581, the explosions sound really loud, almost like breaking the sound system - really effective. The death sound, however, is a simpler and less cartoony version of the same idea, now lacking the mocking style of the sound effect on the Atari. Finishing a level is similar enough to the Atari version, which is a bit boring, really, but doesn't give it any sort of disadvantage. Most of the sounds in the APPLE version feel rather unspecific for the game, as the walking noises are just different types of farty drilling sounds, and the sounds for picking up things, dying and finishing the level are very unlike the ones on either the Atari or C64 version. It just doesn't feel right in any way. The only thing I can say in the Apple version's defense is that the music is pretty much what it should be and there are only sound effects during the game, but I can't say I like it very much. Prospector Pete is even less vocal in his underground adventures on the C16. Like on the Atari, Pete will only make sound when making new tunnels, and makes a few curiously toneless sweeping noises when he dies. Water doesn't make any kind of sound in this game, but the explosions, its detonation process, the pick-up sound and the level-finishing sounds are there, even if they're each of them slightly less dramatic than on either the Atari or the C64. It's still slightly more enjoyable than the Apple version, but it's a pity there is no music of any kind here. Overall, the Atari sounds are the most fitting for a game of this age, being both more powerful where needed and more cartoony in other places than the C64 sounds. But then again, the C64 sounds are slightly more advanced in certain ways, particularly when it comes to the music, so I'd say it's a tie. The other contestants are quite clear, I think. And that's how it is. If you were to take the loading times into account, then the C64 version would have won, but since we are living in 2015 now, let's just not. I'd say every version of O'Riley's Mine is worth a test, just to see all the differences for yourself, but if you want to know which version is the definitive one, I can't really make that choice. That's it for now, hope you enjoyed it! I'm going for a short cabin holiday, so the next entry will be more delayed than usual, but I'll be back with another entry in the Unique Games series, so watch out for that one. In the meantime, do throw in a comment, they are always nice to read.